Located just up the road from Hankies Cafe an Indian restaurant I reviewed recently Thai Square is another of those hidden gems that you really should visit. It’s the perfect place for Thai food lovers and great for those that need a quick bite before or after visiting the theatre. Service is quick which was great as I was famished when I arrived to eat with my friend. If only I was faster at deciding what I wanted to eat as there were plenty of tempting dishes on the menu it did make it hard to decide quickly. The atmosphere here was nice and relaxed and the staff are on hand should they be needed – of course I watched them interacting with other diners too. The restaurant was nicely set out, spacious and very clean and I will add should you make sure you visit the bathroom take it. Their bathroom was spotless and looks modern and smells gorgeous. If my memory serves me correctly it smelt like jasmine and is probably the best smelling bathroom I have ever visited. The menu is varied and you will find specials, set menus as well as an A La Carte section. There is also a great wine and cocktail selection. We began with cocktails whilst awaiting the food. Fresh lychee, fresh lemongrass, lemongrass infused vodka, ginger infused vodka, lychee liqueur, lychee juice, lime and demerara sugar. This cocktail was lovely. It was nice and sweet just as I like them. There were chunks of lychee and lemongrass within the cocktail which was nice although it did block up the straw so I fished it out and ate it. Fresh passion fruit, Passoa liquer, lychee liqueur, Bacardi 8yrs, passion fruit juice, orange juice, demerara sugar. This packs a fruity, tangy tropical punch. It is a great cocktail full of flavour, refreshing and easy to drink. It’s a nice sized cocktail and great for a night out with the girls. 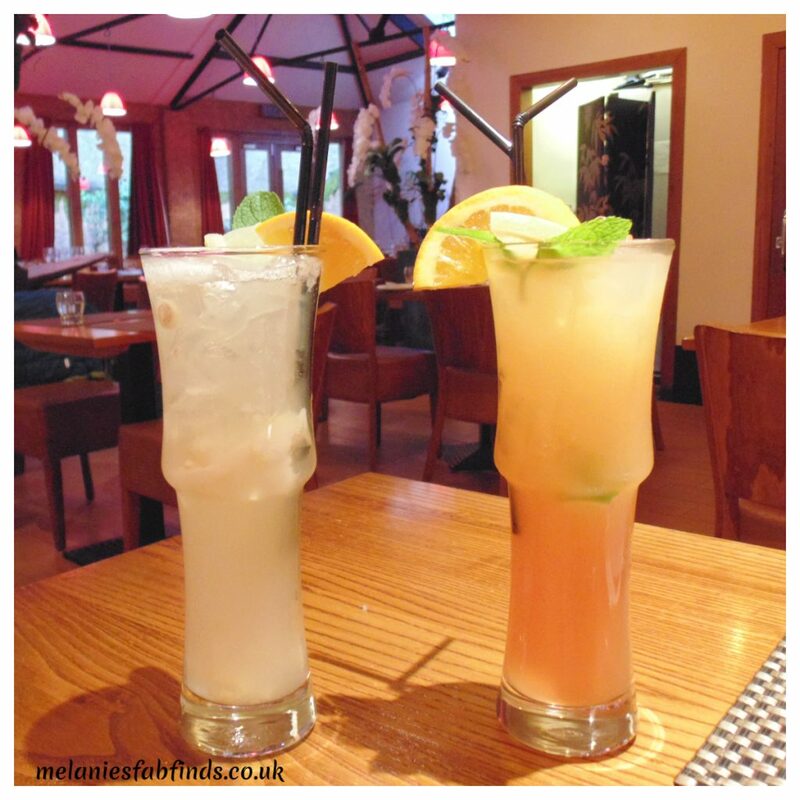 Both cocktails look impressive when they arrive at the table and tasted as good as they looked. Deep fried squid in batter topped with spring onion, salt, pepper and a touch of fresh chillies. This was perfectly seasoned and not at all greasy. The batter was not too thick and the squid was fresh and perfectly cooked so it was tender and some of the best salt and chilli squid I’ve has the fortune to enjoy. When made right this is a beautiful dish with the texture contrast of from the squid and batter and the flavour contrast from the salt and chilli. Minced chicken and prawns, water chestnuts, shitake mushroom and pepper wrapped in wanton leaves, steamed and topped with fried garlic. Served alongside sweet soya sauce. There was so much flavour in this you could easily eat it without the sweet soy sauce provided although it did complement the dish well. This was a lovely meaty dish with nice sized chunks of prawns hidden within. A dish I would strongly recommend trying. and herbs with a hint of Whisky. This was a very tasty dish. The portion was good and there were nice sized pieces of lamb that were not at all fatty. 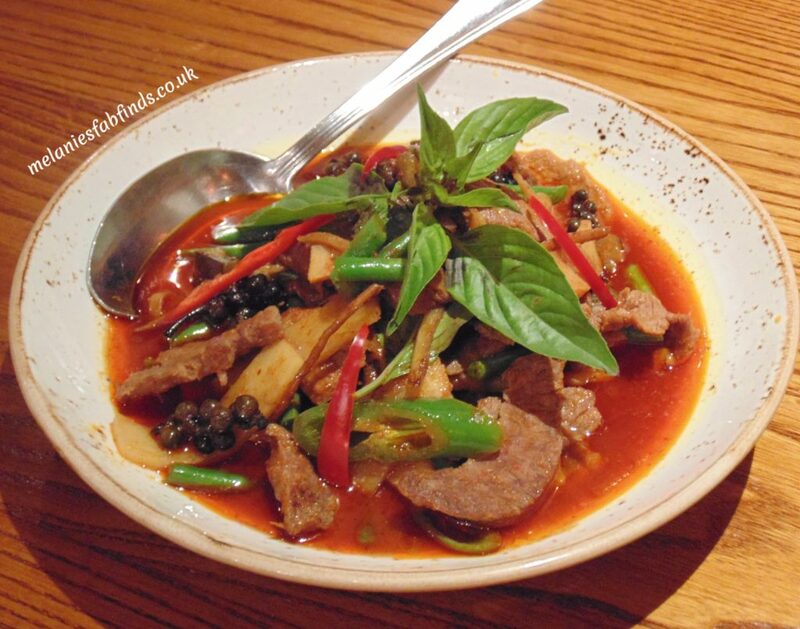 The fresh chilli and fresh peppercorns worked well as did the fresh Thai basil which really does add an amazing flavour. Stir fried scallops sautéed with peppers, garlic, coriander and spinach in chef’s special paste. The sauce this came in was amazing. There was so much flavour in this dish and I really was pleased I had chosen it. 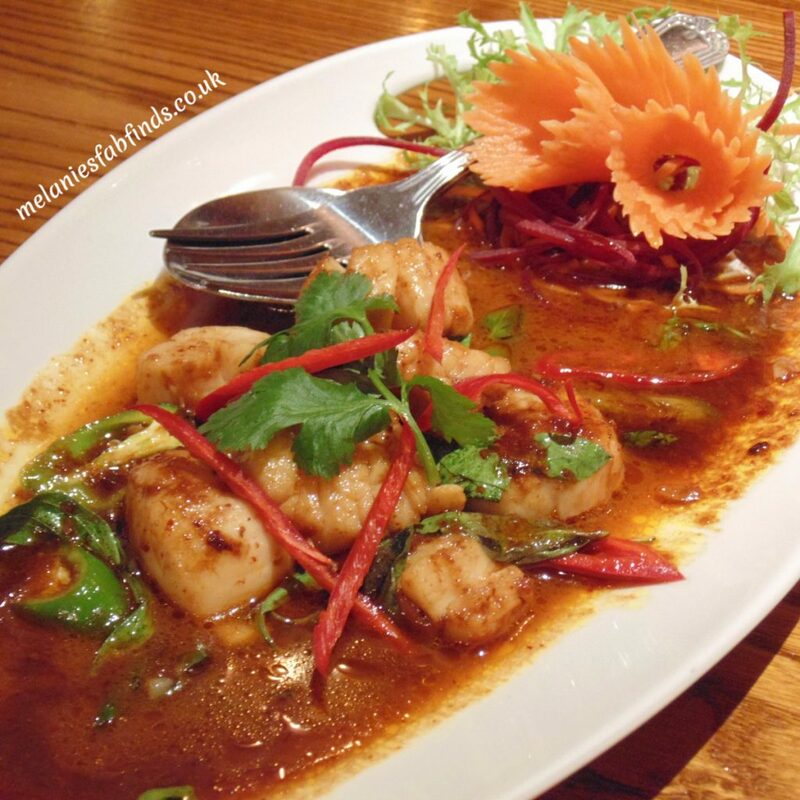 The scallops were large and juicy and worked well with the mix of chilli and the sweetness of the sauce as did the fresh coriander and Thai basil. I loved there were nice sized chunks of red and green chilli to add heat and colour. The pak choy was cooked to perfection with a good crunch to it and nice green leaves. The sauce was amazing and rather addictive with just the right amount of garlic. The rice was great and the coconut flavour complemented the rest of the dishes well. This was drizzled with coconut creamy and finished with a sprinkle of toasted coconut. I would suggest making sure you get a rice dish so you can soak up all the juices from other dishes as you WON’T want to waste them once you sample them. The dishes were all well presented were reasonably sized and tasted great. Everything was fresh and prepared to order including the garnish. Prices are not excessive for the West End. Disclaimer: I was invited along to Thai Square to sample the dishes in return for an honest review. I must say I was so pleased to have discovered this restaurant and hope to enjoy more of their dishes on one of my shopping trips. And before you ask I will be returning for more of that that ice cream as it was fabulous!!! All the food looks so delicious. It gave me a major craving for thai food. Loved the interiors. The Scallops and Dumplings seem yum. Will check them out some time for sure! They were delicious I am certain you will enjoy your meal there too. That is something I have also heard. I should have popped into the kitchen to take a look lol. It’s good to try new things even if it’s just sometimes. You can then discover new favourites. I’ve only eaten Thai food once but I must say they have a great taste. These foods look appetizing. Would go for that dessert anytime! You must try this restaurant their food is fantastic. I would definitely go again. It was fantastic. The flavours were all spot on for the food and the dessert. The chilli lamb looks so tasty and would be something I think I’d enjoy. I’ve not really had much Thai food but I would love to try out more of it now! It’s a great cuisine with a lovely range of flavours. I really do love Thai. Ooh chilli lamb sounds amazing! I love thai food but haven’t been here, although I love covent garden! There’s some gorgeous places tucked away! There sure are. You might like to try this one the food is very good. What an interesting place to grab a bite to eat, I have to admit out of everything the drinks and the desserts really turn my head. They sure were yummy although I’m sure you’d be impressed with the food. It’s true there are plenty of hidden gems and it’s great when you find one. Glad you liked it. The coconut rice was yummy and really good with the food. I bloody L O V E thai food and this post has made me want to go get some right now! The Me 2 You cocktail is exactly what I’d pick, as well as the Salt & Chill Squid! OMG this is just what you need. You are going to love this place soooo much!!! It is great there isn’t it. Their dumplings are fantastic! Wow, what a lovely looking restaurant and those cocktails looked like something else!! Those cocktails were very good! I love the look of the restaurant. The food looks so yummy and very nicely placed! Very elegant! And those cocktails are calling my name!!! You have to try the cocktails they are really good. No problem. I hope you get to visit them soon. 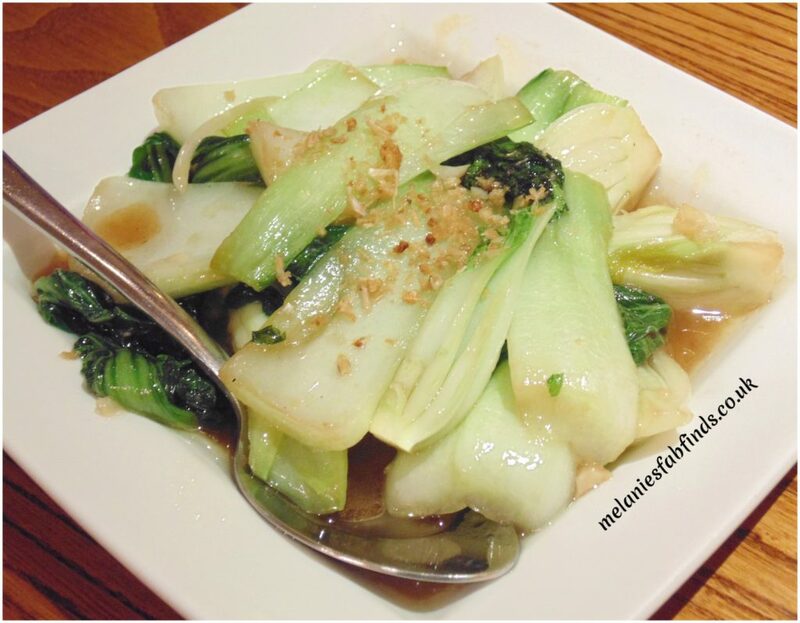 Pak Choy is yummy when done correctly and this was perfectly cooked and flavoured. I am not surprised the cocktails were fantastic. Thai square Convent Garden looks like a nice place to relish Thai food. 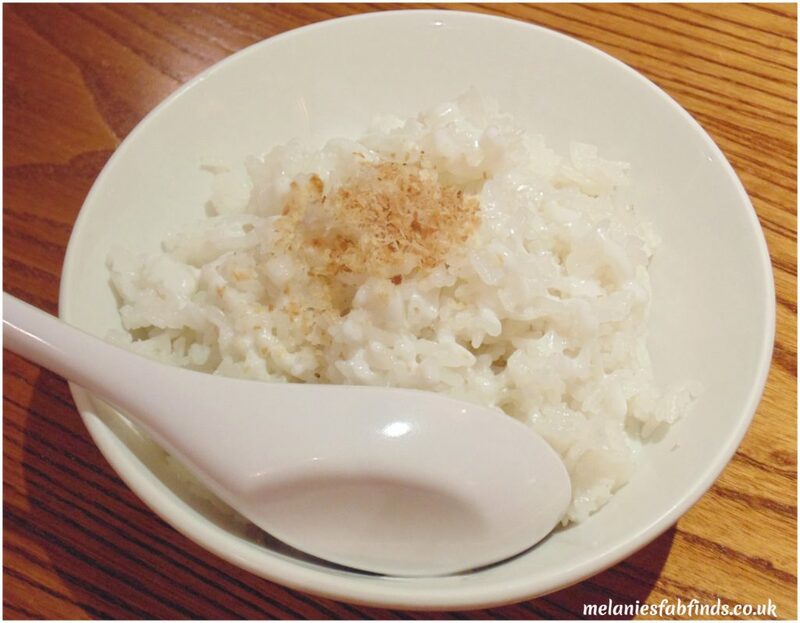 I would love to taste coconut rice because I have never had this before. 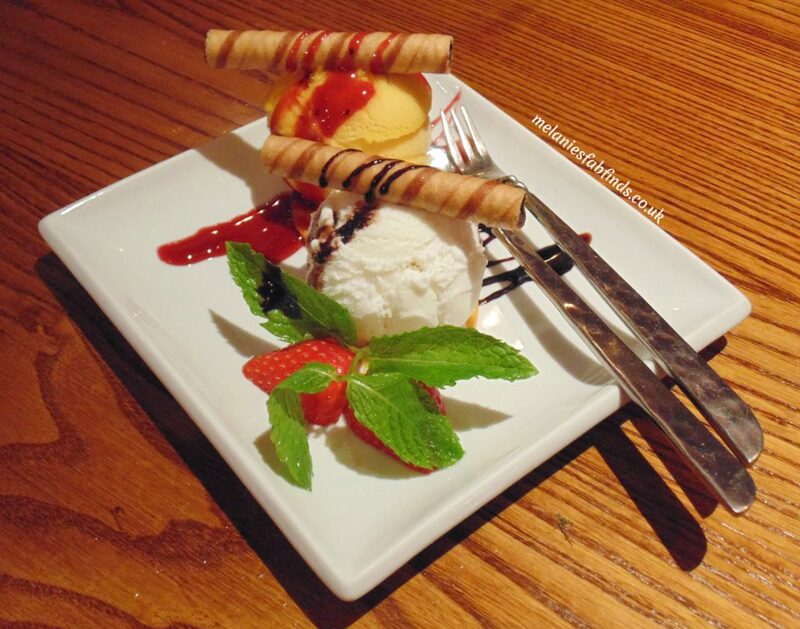 In desserts mango and coconut icecream is a great option as it is looking so full and delicious. I just adore Thai food, all the food you tried looks wonderful. I love seeing reviews before I go to a restaurant. You rally get a good feel for the place before you go. Delicious, coconut rice, wow that would have had a lovely taste. Loved those ice creams as well. Loved the cocktail glasses as well. This looks really delicious, the perfect date night spot. In fact I bet my husband would really love this food. I absolutely love Thai food so definitely want to check this place out next time I’m down in London and in the area! I love Thai and this food was all fresh and tasty. Enjoy! That place sounds great and their food and beverages look delish especially the mango and coconut ice cream. That was fantastic!!! OMG the flavours were spot on. There is so much more to it. They boast a huge range of dishes with amazing flavours. I haven’t heard of Thai Square before, but I’ll definitely have to visit some time soon! Their food looks amazing. I feel like I shouldn’t have read this now. Now I am hungry. The chili scallops look amazing. And the cocktails just sound so refreshing. Will have to pick one up soon. A Jasmine smelling bathroom is refreshing. I like this restaurant already. Seems they have it all together including awesome staff plus the food looks fantastic! That thai restaurant looks like a great place to eat. I really like that crystal ball drink looks so refreshing and tasty. Would love to try this restaurant soon. It was a really good drink for sweet cocktail lovers. I loved it! This looks a great place to visit. Thai food is my favourite, I would love the chilli lamb and the cocktails too as they sound amazing. The food was amazing it had so much flavour. I do love a good restaurant review and this place looks incredible. The food looks amazing and the drink looks awesome. I really want to try that drink! I love Thai food and those dumpling look amazing. I am totally craving Thai food now. I’m not surprised it is great food and these dishes look as good as they taste. I bet you love it too Lisa! That’s such a shame.Good restaurants are not always easy to find. I am fussy about what I will feature and only good restaurants will appear on my blog. You sure do. Their food was lovely and I wouldn’t hesitate to go back again. omg I love thai food! This place looks incredible! That chili lamp popped up my curiosity! Would love to taste it! And those cocktails! Well, I’m pretty sure there are quite a lot more cocktails on the menu. It looks really elegant and would love to have a lovely dinner there! The restaurant looks great and seems to be quite popular too. The smell of the dishes as they come out is amazing!!! I love Thai food, it’s great that it’s becoming more popular! Same here I love the mix of flavours especially coconut. That’s such a shame Claire. I hope you get to try this restaurant next time it’s really good. The food looks great those cocktails look delicious! Every thing was really good. The food and drinks were all packed with flavour. It’s really good!!!! You must go try it. The food here is fantastic. I loved it. Food looked good must admit wouldn’t mind tasting one of those cocktails like the sound & look of the ‘Crystal Ball’ & the desert looked great too. The pictures are beautiful and the crystal ball drink looks lovely and sounds very refreshing! Yummy! The food there looks amazing! I may have to visit when I’m there next! Oh wow, it all looks so beautifully presented and delicious!